Unlike the rest of us, members of our national security state exist in what might be called ‘post-legal’ America. How the mighty have fallen. Once known as “Obama’s favorite general,” James Cartwright will soon don a prison uniform and, thanks to a plea deal, spend thirteen months behind bars. Involved in setting up the earliest military cyberforce inside US Strategic Command, which he led from 2004 to 2007, Cartwright also played a role in launching the first cyberwar in history—the release of the Stuxnet virus against Iran’s nuclear program. A Justice Department investigation found that, in 2012, he leaked information on the development of that virus to David Sanger of The New York Times. The result: a front-page piece revealing its existence, and so the American cyber-campaign against Iran, to the American public. It was considered a serious breach of national security. On Thursday, the retired four-star general stood in front of a US district judge who told him that his “criminal act” was "a very serious one" and had been “committed by a national security expert who lost his moral compass." It was a remarkable ending for a man who nearly reached the heights of Pentagon power, was almost appointed chairman of the Joint Chiefs of Staff and had the president’s ear. In fact, General James Cartwright has not gone to jail and the above paragraph remains—as yet—a grim Washington fairy tale. There is indeed a Justice Department investigation open against the president’s “favorite general” (as Washington scribe to the stars Bob Woodward once labeled him) for the possible leaking of information on that virus to The New York Times, but that's all. He remains quite active in private life, as the Harold Brown Chair in Defense Policy Studies at the Center for Strategic and International Studies, as a consultant to ABC News, and on the board of Raytheon, among other things. He has suffered but a single penalty so far: he was stripped of his security clearance. A different leaker actually agreed to that plea deal for the thirteen-month jail term. Nearly three weeks ago, ex-State Department intelligence analyst Stephen E. Kim pled guilty to “an unauthorized disclosure of national defense information.” He stood before US District Judge Colleen Kollar-Kotelly, who offered those stern words of admonition, and took responsibility for passing classified information on the North Korean nuclear program to Fox News reporter James Rosen in 2009. Still, someday Cartwright might prove to be unique in the annals of Obama era jurisprudence—the only Washington figure of any significance in these years to be given a jail sentence for a crime of state. Whatever happens to him, his ongoing case highlights a singular fact: that there is but one crime for which anyone in America’s national security state can be held accountable in a court of law, and that’s leaking information that might put those in it in a bad light or simply let the American public know something more about what its government is really doing. If this weren't Washington 2014, but rather George Orwell’s novel 1984, then the sign emblazoned on the front of the Ministry of Truth—“War is Peace, Freedom is Slavery, Ignorance is Strength”—would have to be amended to add a fourth slogan: Knowledge is Crime. With Cartwright as a possible exception, the members of the national security state, unlike the rest of us, exist in what might be called "post-legal” America. They know that, no matter how heinous the crime, they will not be brought to justice for it. The list of potentially serious criminal acts for which no one has had to take responsibility in a court of law is long, and never tabulated in one place. Consider this, then, an initial run-down on seven of the most obvious crimes and misdemeanors of this era for which no one has been held accountable. *Kidnapping: After 9/11, the CIA got into kidnapping in a big way. At least 136 “terror suspects” and possibly many more (including completely innocent people) were kidnapped off the streets of global cities, as well as from the backlands of the planet, often with the help of local police or intelligence agencies. Fifty-four other countries were enlisted in the enterprise. The prisoners were delivered either into the Bush administration’s secret global system of prisons, also known as “black sites,” to be detained and mistreated, or they were “rendered” directly into the hands of torturing regimes from Egypt to Uzbekistan. No American involved has been brought to court for such illegal acts (nor did the American government ever offer an apology, no less restitution to anyone it kidnapped, even those who turned out not to be “terror suspects”). One set of CIA agents was, however, indicted in Italy for a kidnapping and rendition to Egypt. Among them was the Agency’s Milan station chief Robert Seldon Lady. He had achieved brief notoriety for overseeing a la dolce vita version of rendition and later fled the country for the United States. Last year, he was briefly taken into custody in Panama, only to be spirited out of that country and back to safety by the US government. To be accurate, a single member of the national security state has gone to prison thanks to the CIA’s torture program. That was John Kiriakou, a former CIA agent who tortured no one, but offended the Obama administrations by turning whistleblower and going public about Agency torture. He is now serving a thirty-month prison sentence “for disclosing a covert operative’s name to a reporter.” In other words, the only crime that could be prosecuted in connection with the Agency's torture campaign was one that threatened to let the American public know more about it. Now, however, thanks to leaks from the embattled Senate Intelligence Committee’s 6,300-page report on the CIA’s interrogation and torture program, we know that the Agency "used interrogation methods that weren’t approved by the Justice Department or CIA headquarters." 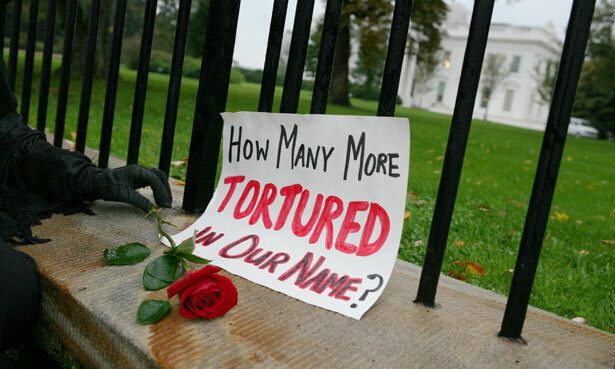 In other words, its agents went beyond even those techniques approved in the torture memos, which in turn means that they acted illegally even by the standards of the Bush administration. This should be an obvious signal for the beginning of prosecutions, but—not surprisingly—it looks like the only prosecution on the horizon might be of whoever leaked parts of the unreleased Senate report to McClatchy News. *The destruction of evidence of a crime: To purposely destroy evidence in order to impede a future investigation of possible criminal acts is itself, of course, a crime. We know that such a thing did indeed happen. Jose Rodriguez, Jr., the head of CIA clandestine operations, destroyed ninety-two videotapes of the repeated waterboardings of Khalid Sheikh Mohammed, who planned the 9/11 attacks, and alleged al-Qaeda operative Abu Zubaydah, “tapes that he had been explicitly told to preserve as part of an official investigation.” The Justice Department investigated his act, but never charged him. He has since defended himself in a book, Hard Measures, saying that he was, in essence, “tired of waiting for Washington's bureaucracy to make a decision that protected American lives.” He is still free and writing op-eds for the Washington Post defending the interrogation program whose tapes he destroyed. *The planning of an extralegal prison system: As is now well known, a global network of extralegal prisons, or “black sites," at which acts of torture and abuse of every sort could be committed was set up at the wishes of the highest officials of the Bush administration. This system was created specifically to avoid putting terror suspects into the US legal system. In that sense, it was by definition extralegal, if not illegal. It represented, that is, a concerted effort to avoid any of the constraints or oversight that US law or the US courts might have imposed on the treatment of detainees. This was a well-planned crime committed not under the rubric of war against any specific power, but of a global war without end against Al Qaeda and like-minded groups. *Assassination: Once upon a time, off-the-books assassination was generally a rare act of state and always one that presidents could deny responsibility for. Now, it is part of everyday life in the White House and at the CIA. The president’s role as assassin-in-chief, as the man who quite literally makes the final decision on whom to kill, has been all-but-publicly promoted as a political plus. The drone assassination campaigns in Pakistan, Yemen and Somalia, though “covert” and run by a civilian agency (with much secret help from the US Air Force) are openly reported on in the media and discussed as a seeming point of pride by those involved. In 2009, for instance, then-CIA Director Leon Panetta didn’t hesitate to enthusiastically praise the drone attacks in Pakistan as “the only game in town.” And best of all, they are “legal.” We know this because the White House had the Justice Department prepare a fifty-page document on their legality that it has refused to release to the public. In these campaigns in the backlands of distant places where there are seldom reporters, we nonetheless know that thousands of people have died, including significant numbers of children. Being run by a civilian agency, they cannot in any normal sense be “acts of war.” In another world, they would certainly be considered illegal and possibly war crimes, as Christof Heyns, the UN special rapporteur on extrajudicial killings, has suggested. Top officials have taken responsibility for these acts, including the drone killings in Yemen of four American citizens condemned to death by a White House that has enthusiastically taken on the role of judge, jury and executioner. No one involved, however, will ever see a day in court. *Perjury before Congress: Lying to Congress in public testimony is, of course, perjury. Among others, we know that Director of National Intelligence James Clapper committed it in a strikingly bald-faced way on March 12, 2013. When asked by Senator Ron Wyden whether the NSA had gathered “any type of data at all on millions or hundreds of millions of Americans”—a question submitted to him a day in advance—Clapper answered, “No, sir. Not wittingly. There are cases where they could inadvertently perhaps collect, but not wittingly.” This was a lie, pure and simple, as the Snowden revelations on the NSA’s gathering of phone metadata on all Americans (including, assumedly, our congressional representatives) would later make clear. Clapper subsequently apologized, saying that he spoke in what he called “the least untruthful” way possible, which, were crime on anyone’s mind, would essentially have been a confession. Congress did nothing. Just in case you wondered, Clapper remains the director of national intelligence with the “support” of the president. All in all, as with the banks after the meltdown of 2007-2008, even the most obvious of national security state crimes seem to fall into a "too big to fail”-like category. Call it "too big to jail." The only crime that repeatedly makes it out of the investigative phase and into court—as with Stephen Kim, Chelsea Manning and John Kiriakou—is revealing information the national security state holds dear. On that, the Obama administration has been fierce and prosecutorial. Of course, leaking is a habit that’s often considered quite useful by those in power. It’s little short of a sport in Washington, done whenever officials feel it to be to their advantage or the advantage of an administration, even if what's at stake are “secret” programs like the CIA’s drone campaign in Pakistan. What’s still up in the air—and to be tested—is whether leaking information in the government’s supposed interest could, in fact, be a crime. And that’s where General Cartwright comes in. If there is, in fact, but a single crime that can be committed within the national security state for which our leaders now believe jail time is appropriate, how wide is the category and is knowledge always a crime when it ends up in the wrong brains? If there were one man of power and prominence who might join Kim, Kiriakou, Manning and Edward Snowden (should the US government ever get its hands on him), it might be Cartwright. It’s a long shot, but here’s what he doesn’t have going for him. He was an insider who was evidently an outsider. He was considered "a lone wolf" who went to the president privately, behind the backs of, and to the evident dismay of, the chairman of the Joint Chiefs and the Secretary of Defense. He seems to have had few supporters in the Pentagon and to have alienated key Republican senators. He could, in short, prove the single sacrificial lamb in the national security state.